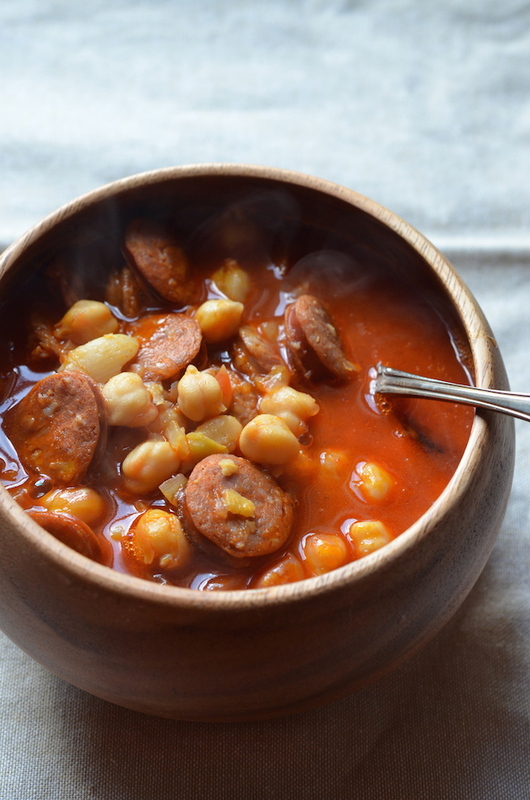 This simple Spanish-style Chickpea & Chorizo soup is a favorite at our house, making an appearance at least once a month (if not more!) during the chilly months. While the base recipe--what I've shared with you here--is always the same, I also love to bulk this up with other goodies found in the fridge. 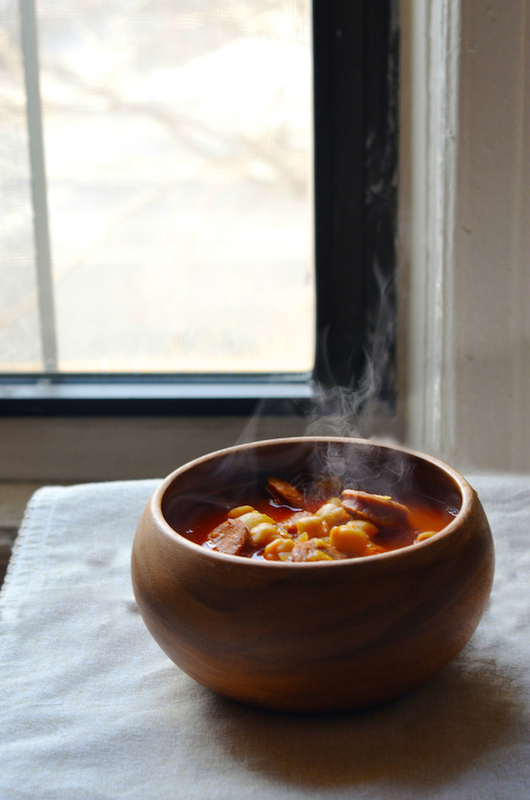 Some of my favorite additions include wilted kale or spinach, diced turnip or butternut squash, shrimp, kidney beans, and even chunks of creamy diced avocado floated on top just before serving. It's endlessly adaptable, and always satisfying. 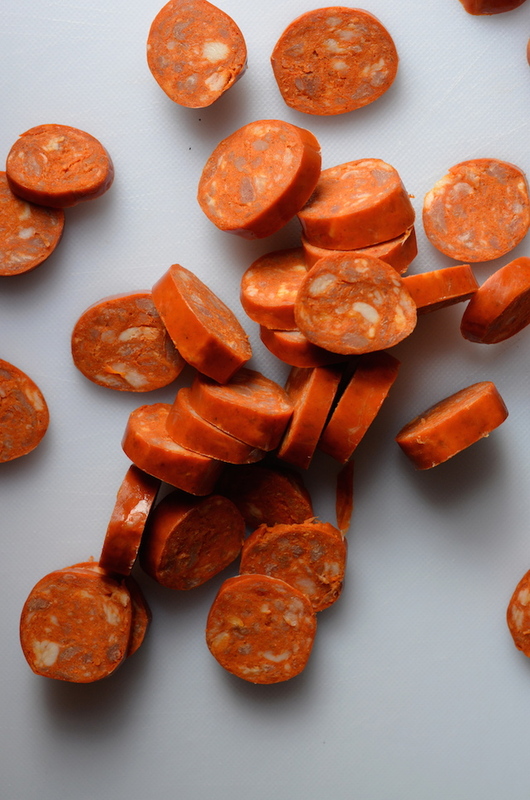 The recipe starts off simply--sliced Spanish-style chorizo sauteed with onions and garlic until fragrant. Then you add some rinsed canned chickpeas, tomatoes, a few spices, and chicken broth, and let the whole thing simmer for about half an hour or so. And that's really it! Serve it up right away, or divide into batches for lunch tomorrow. This thing can be heated and reheated half a dozen times, and it always tastes fantastic. Heat the olive oil in a large pot over medium heat. Add the chorizo and onion, and saute until the chorizo is slightly crisp, and the onion is soft. Add the garlic, paprika, cumin, and cayenne, and stir to combine well. Add the chickpeas, tomatoes with their liquid, and broth. Bring to a boil, then lower heat and let simmer about 20 minutes or until broth has reduced slightly. Season to taste with kosher salt and black pepper, and serve.